A dangerous legal loophole means doctors registered in the UK can prescribe unlicensed (non-NHS approved) medicines, provided they take personal responsibility for them. Cindy Cartwright began taking fen-phen 23 years ago to drop some weight she had gained following the birth of her youngest child. She only took the drug for six months, but more than two decades later, Cartwright’s health has suffered because of fen-phen. Commonly abused diet drugs include amphetamine-like appetite suppressants phentermine (trade name Duromine), Diethylpropion (also known as amfepramone), dexfenfluramine and fenfluramine (Phen-fen). They’re highly addictive, disrupt sleep and can cause mood swings, chest pains, palpitations, nausea, headaches, dizziness, anxiety, hallucinations and high blood pressure. Also abused is methylphenidate (trade name Ritalin) – a drug for Attention Deficit Hyperactivity Disorder – and sibutramine (Reductil), an appetite suppressant banned in the UK due to possible links with heart disease. Buy from a well-known UK pharmacy or ship. This way you know the product is safe, even if its efficacy hasn’t been proved. If you buy online, only buy from EU sources. ‘Natural’ or ‘herbal’ from other countries doesn’t necessarily mean safe, say the MRA. Remember they’re slimming ‘aids’ not ‘solutions’. If your diet and lifestyle have caused you to put on weight, then it’s your diet and lifestyle that will have to change. If you’re worried about the safety of a product, call MHRA on 020 3080 600. Warning: It won’t be pretty! 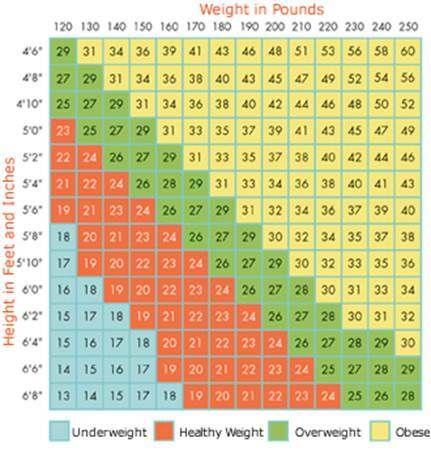 The BMI (Body Mass Index) scale uses your height and weight to determine if you are underweight, a healthy weight, overweight, or obese.